The splash page to Uncanny X-Men Annual #3 is filled with fun inside references to creators in the Marvel Bullpen. 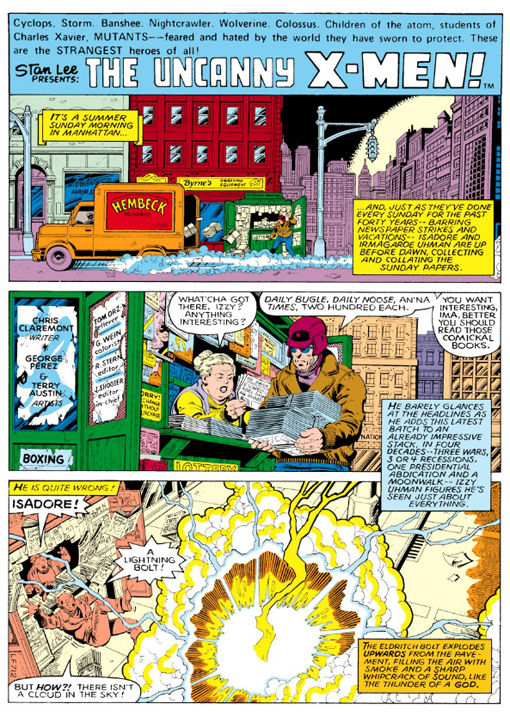 In the first panel, there's the (Fred) Hembeck Deliveries truck and (John) Byrne's Drafting Equipment store behind the news stand. In addition to the issue credits in the second panel, one of the headlines in the Daily Bugle is Escaped Able Sighted In Miami in a reference to Marvel inker Jack Abel. The news stand also has Ms. Marvel on the cover of a magazine and a few comics for sale, including an issue of the Fantastic Four. These little Easter Eggs certainly make you feel a sense of camaraderie and a fun spirit about the Marvel creative team in that era.